Because it is not connected to an ocean, the Dead Sea is not technically a sea, but a lake. For the last 60 years, it has been shrinking as the surrounding populations of Syria, Israel, Jordan and the West Bank have depleted its main water sources — the Jordan River and Sea of Galilee (also a lake) — and as fertilizer and chemical companies in both Israel and Jordan evaporate its water to extract minerals, scientists say. 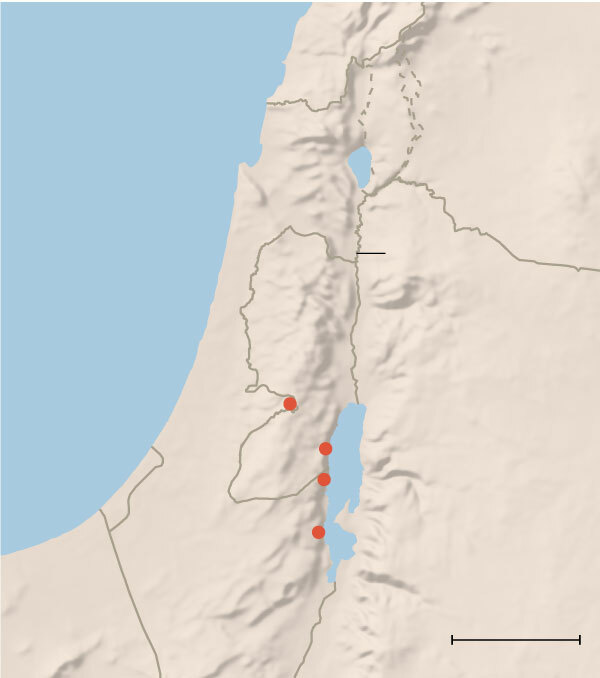 The surface area of the lake has contracted by about a third to its current 630 square kilometers, according to the Geological Survey of Israel. Hotels and spas that once lined the waterfront are now hundreds of meters from the shoreline, and some resorts and beaches have been forced to close in recent years because of the thousands of sinkholes that have resulted from the drying up of the water and the ground around it. Fences with signs warning of sinkholes line much of the western coast, whose dry brown expanse is also dotted with abandoned date palm groves, closed roads, and shuttered buildings, including a defunct gas station. In many places the shoreline is covered with crusts of salt. Pillars and blobs of salt rise from the shallow edges of the water. The eerie, yet enchanting, landscape is increasingly drawing visitors. In 2017, the number of overnight stays in Israeli hotels on the Dead Sea rose 35 percent compared to 2016, according to Israel’s Central Bureau of Statistics. Betting on continued growth, Israel’s tourism ministry recently spent 500 million shekels, or about $13 million to renovate beaches, and build a waterfront walkway at the resort area of Ein Bokek on the Dead Sea’s southern basin, where a new shopping mall opened in November. Two new hotels are also in the planning stages, the first significant development in more than 30 years. The southern basin — always shallower than the deep northern basin where Mr. Ben Zaken runs his boat trips — would be completely dry now if the companies harvesting salts and minerals from the Dead Sea didn’t pump water into it, according to scientists. In Jordan, where the number of tourists rose about 8 percent in 2017 compared to 2016 and is on track to increase at a similar rate in 2018, a new Hilton Hotel opened last year on the Dead Sea, and $1.5 billion joint Kuwaiti-Jordanian government project is underway to build more hotels, an amusement park and other tourism infrastructure along the seashore. While the northern basin will likely not disappear any time soon, it is expected to become shallower and to lose an additional 10 percent of its surface area in the next 50 years, said Nadav Lensky, the head of the Geological Survey’s Dead Sea Observatory, which researches evaporation and other dynamics of the sea. “The Dead Sea is the only place in the world where we see this phenomenon in modern time,” Mr. Lensky said, explaining that millions of years ago, halite precipitation in many of the deep saline lakes that once covered the earth led to the creation of massive, thick salt deposits in places like Poland’s Wieliczka salt mines and the oil-rich Delaware Basin under Texas and New Mexico. It is also halite precipitation that has created the salt sculptures that first began peaking out above the surface of the Dead Sea about 10 years ago, Mr. Lensky said. Because the shape, size and number of salt crystals piling up on the sea bottom vary with the water’s salinity, evaporation rate and temperature, the resulting structures also vary in shape, he said. With much of the sea’s western shore off limits because of sinkholes, Mr. Ben Zaken’s blue and red Dutch-made boat — named Nefeli after a cloud nymph in Greek mythology — is the only way to see this otherworldly salty landscape up close. The tours, which require advance reservation, leave from the Dead Sea shore near the Mitzpe Shalem settlement on the Israeli-occupied West Bank, about 45 miles from Jerusalem. A one-and-a half-hour tour is 180 shekels ($48) and a three-hour tour is 250 shekels ($67) per person. The boat holds up to 12 people. Bobbing among the salt towers, Mr. Ben Zaken pointed out similar structures on the shore, where the water has receded, now brown and gray, and some toppled over. Mr. Ben Zaken, 54, -who lives in Mitzpe Shalem, served in Israel’s Navy and worked on a commercial crab boat in Alaska. He cranked up the motor and headed to deeper water. The salt formations faded into the distance, as did the desolate brown beaches beyond them. Across the water to the east rose Jordan’s pink Abarim mountains. “I am all alone out here,” Mr. Ben Zaken said as he reached a speed of about 25 knots, fast enough to leave a wake on the water, which reaches depths of about 1,000 feet. Aside from a scientific research boat located several miles south near Ein Gedi, and not visible from here, Mr. Ben Zaken’s Nefeli — and the fleet of kayaks he began operating last year — were the only vessels on the Dead Sea. Military restrictions, a constantly-receding shoreline and expensive maintenance to prevent salt buildup on the bottom of vessels all make boating here difficult, and contributed to the closing about 15 years ago of a large wooden ship named Lot’s Wife (she famously turned into a pillar of salt in the Bible) that took groups of tourists out on the water, Mr. Ben Zaken said. But historical texts and archaeological finds of ancient anchors and harbors indicate that the Dead Sea had a thriving maritime culture for thousands of years. “Like any other sea, it should have boats,” said Mr. Ben Zaken, who bought his first boat in 2011, when he was working as an auto mechanic, then waited two years for military permission to start using it and build up a tour business. Last year, he added kayak tours, bought a second boat, and is looking to hire an additional skipper to meet growing demand. Out on the water, Mr. Ben Zaken slowed his boat near what looks like a wall of brown stairs on a nearby shore. “Each one of those steps is a year of losing water,” he said. 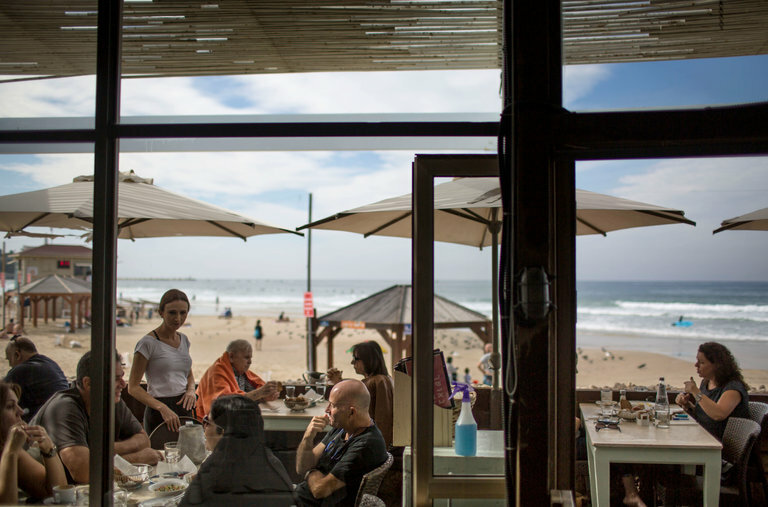 Continuing south, the last stop on tour was his kibbutz’s Mineral Beach resort, which was forced to close in 2015 after a large sinkhole opened up, swallowing up palm trees, the parking lot and some buildings. The air smelled like sulfur, and the water was the color of pea soup. The lifeguard stand had collapsed onto the gray sand, and empty lounge chairs sat under thatch palm huts. Mr. Ben Zaken pointed to a wooden shed that used to serve as his boat house. After the beach closed, he lost access to the boat shed, and now has to launch his tours from a point further south, reachable only with an off-road vehicle. At the end of each day, he pulls his boat out of the water, loads into on a trailer, then hauls it with a tractor more than half a mile through the desert, over dry land that was once underwater, and rinses the salt water off the boat each night.